Document No 995: Columbia and Shamrock I maneuvering for the start. "11" on negative. Detroit Publishing Co. no. 05525. YACHTS FAIL AGAIN TO FINISH A RACE. ; Wind Too Weak for Them to Cover the Course in Time. NEWPORT, R.I., Oct. 5. -- The second attempt to sail the first of this year's series of races for the America's Cup was made yesterday and, like the first, it ended in a failure for lack of wind. 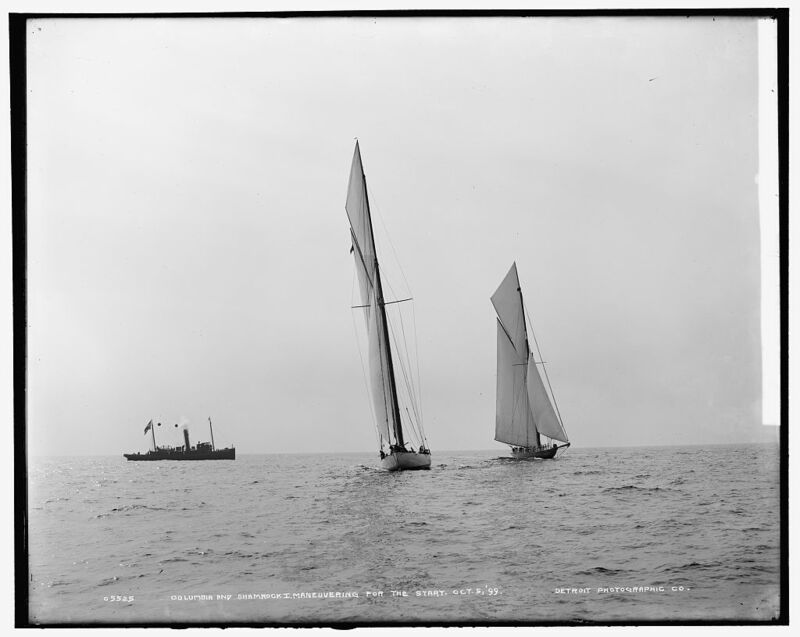 When, fully four miles from the outer mark the competing yachts abandoned the race by mutual agreement. They were at the time on the starboard tack, sailing with their bowsprits even, but the Shamrock about fifty yards to windward.